Caiques love to climb and play and need to be provided with a cage that allows them to move around freely. 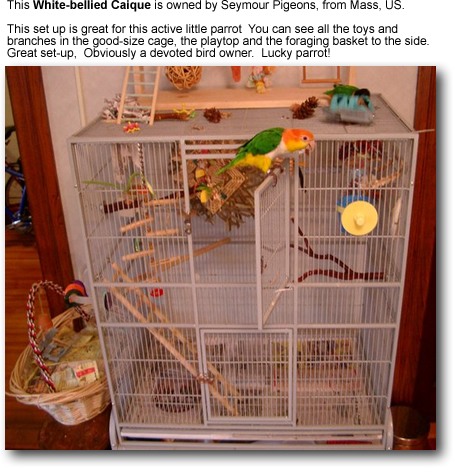 If you keep a pair of caiques, you will obviously need a larger cage than that used for a single bird. There are times when you may want to house any caique pairs in separate cages. This being the case during the breeding season, should the male show aggression towards the female. There have been cases where the male even killed his mate. It's best to watch any pairs carefully. Toys, toys and more toys are a must for these playful birds. 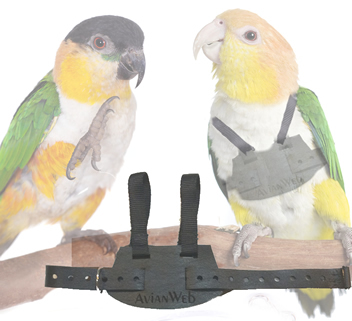 Even though they are small little birds, they go through their toys rather quickly and you would be best served providing a caique with hardy "large-parrot" toys, such as toys specifically made for amazons or cockatoos. Please note the "foraging basket" attached to the cage featured above. This is a great way to keep your pet busy -- store his favorite foot toys in there, cover / wrap them in paper, confetti -- whatever -- this will keep your parrot mentally and physically stimulated.